When he was diagnosed with Stage IV pancreatic cancer in August, Mike Lambros wasn't completely sure he would see Opening Day. In June, he coached North Davidson High School to the North Carolina state championship. Mike Lambros' seven-year-old championship ring is falling off his ring finger. It's from the chemotherapy. Since he started treatment for Stage IV pancreatic cancer 10 months ago, he's lost nearly 35 pounds. He used to be built like a wrestler -- 5-foot-8, 165 pounds. Now, the sleeves of his favorite orange size L quarter-zip sag on his wrists. He cherishes everything about that championship ring he's worn every day since 2010. The interlocking ND on the face. His signature catchphrase, "Yeah Baby," on the right side. An orange No. 1 overlaid on the state of North Carolina. National champions in bold to signify an undefeated season. Two orange diamonds for his two assistants who battled prostate cancer and ALS. 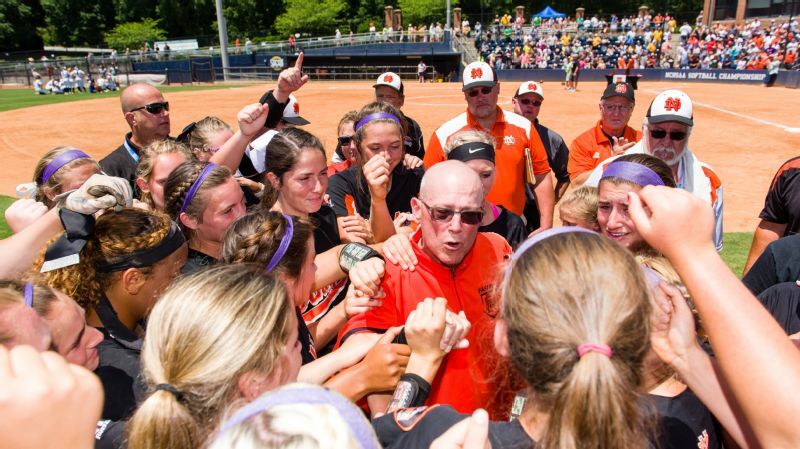 For a number of reasons, 2010 was a magical season for North Davidson High School. His team, filled with talented players who went on to play at Division I schools, was a juggernaut. Lambros coached his team to a perfect 33-0 record to earn his first state championship. Better yet, the Knights ended the year considered national champions, No. 1 in the USA Today High School Softball Poll. And yet, for everything that ring represents, it means so little to the one everyone hopes he'll wear in August. From his cancer diagnosis to the death of his mother, Mike Lambros was incredibly gracious for how the North Davidson High School community rallied around him. This ring is for North Davidson. North Davidson principal Angie Kiger was in a meeting when Lambros sent her a text saying he needed to meet with her. She figured he would be retiring once again. After the 2013 season, Lambros retired from teaching and coaching, but several months later, when the school didn't get any applicants to replace him as head coach, he realized he couldn't escape the field. Kiger was ready to begin her third year as principal and hadn't been as close to Lambros, but she knew who he was from when she played high school ball for East Davidson. Lambros never left Davidson County. He wrestled for Central Davidson High School and would place third in the state. He spent his summers playing softball and working with his father. When he went to Elon, he'd travel to nearby Thomasville as often as he could to see Sharon, with whom he'll celebrate his 38th wedding anniversary in September. In 1978, North Davidson offered him a position that would allow him to teach and coach wrestling and football. In his second year, the athletic director asked if he would take over the softball team, which had been playing slow-pitch at the time. "Most definitely," he said. North Carolina didn't adopt fast-pitch softball until 1996, and for one year the school played at both speeds. He attended and spoke at national conferences, traveling to Tennessee, Texas and Arizona, learning from the best college coaches around. He mastered how to effectively use designated players and substitutions and taught the art of slap-hitting to his players. They would then teach young girls at Lambros' Yeah Baby softball camps he hosted each summer. He adopted the phrase from an Atlanta radio host and would incorporate it into his everyday vocabulary. Huddles would end with "1-2-3, Yeah Baby!" He wanted everyone to have a "Yeah Baby" day. Many of his players attended those youth camps, and by the time they were high school freshmen, he would still remember them by name and face. "There's not a student at North Davidson who doesn't know who Coach Lambros is," Kiger said. "He's just an icon." Yet here he was, telling her he had cancer and didn't know exactly how much longer he had to live. Lambros, who will turn 64 next week, never looked up the expected lifespan for someone with his illness. Sharon did her research but did not want him to get those thoughts into his head. Lambros told Kiger he wanted to be there for his wife, his son, his family and his players. "You are my coach until you tell me that you're not," Kiger said. This ring is for exceptional children. It took 30 years for him to win his first ring. 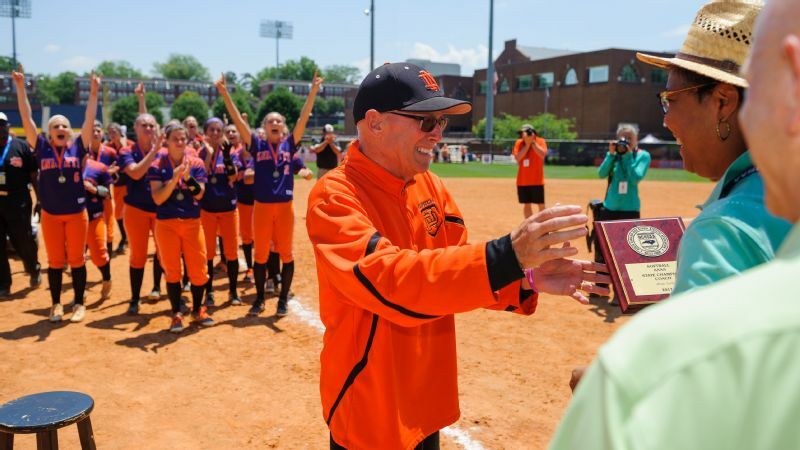 Lambros is the winningest coach in North Carolina high school softball history. He's never won a single game for himself. His varsity teams are often at least 20 players deep. The average travel team has about 12 to 15 players. A smaller roster would allow his players to see more reps, get more practice time, become more skilled. Rarely, if ever, did he cut a player. "Some of these girls need us more than we need them," he'd say. Honestly, we didn't know if he was going to be with us that season at all. It was very possible we could show up and he not be there. Every year, he'd schedule a softball game on the night of the Special Olympics and have his players volunteer. He told them it didn't matter if they won or lost the game. The people who were competing would remember them forever because they made them feel important. Lambros taught in North Davidson's exceptional children's program for kids with special needs. Even now, he chokes up when talking about how much his kids meant to him. Lambros walked away from the program on a full-time basis after 18 years to follow in his mentor's footsteps in the physical education program, but even then there would be some kids in his lifetime sports class who were also in the exceptional children's program. One girl went by the name of Felicia Hamby. One day, she walked into Lambros' office and asked him if she could play on his team. "In a skinny minute," he said. There was one condition: She had to wear a helmet even when she was in the field to protect her. Hamby didn't have a glove, so Lambros bought a black glove for her at the store and gave it to her the next day. She didn't have a bat either, so he bought her a pink Skyla bat. She wore No. 00 and enjoyed singing and cheering in the dugout with the other players. She'd go to Cagney's and eat chicken fingers and fries with her teammates. They accepted her as their own. She loved being part of the team even though she didn't think she'd ever play in a game. But on March 27, 2013, in the middle of a 13-0 blowout against R.J. Reynolds, he called Hamby's name. She entered as a pinch runner and later got an at-bat. Lambros explained the strike zone to her as ice cream. "Many times as a hitter, we give in and say, 'Aww, I'll just take vanilla,' and that's a bad pitch, instead of looking for chocolate," he said. She stepped up to the plate with the bases loaded. On a 2-0 count, the umpire called a strike. She turned and said, "That wasn't chocolate!" The crowd laughed. "For her to realize that was amazing," Lambros said. Three pitches later, she worked a walk, running to first base with her arms raised and the dugout roaring. "That was the happiest day of my life," she said. That game ball is one of three that sit on Hamby's dresser, where she relives that memory every day. She lives in a group home and works at a shelter workshop. She follows everything about Lambros and North Davidson. When she found out about Lambros' diagnosis, she tried to refrain from crying because she knew he would tell her he was going to fight it and he would keep his head up. She tracked North Davidson's championship run on Facebook, and when everyone posted about the win, she was so happy she started singing. "Since I was so close to Coach Lambros," Hamby said, "I feel like I won the championship too." Mike Lambros coached North Davidson High School to an undefeated season and national championship in 2010, but the state title in 2017 carries a special significance. This ring is for the coaches. Assistant coach Billy Gerald downplays his cancer treatment. Doctors discovered he had prostate cancer early in 2010, and he said he underwent 32 straight days of radiation. Lambros did everything he could to help Gerald, carrying his bags at the airport while they were traveling across the country, trying to make sure he got as much rest as he could so he could take care of his health. Gerald prefers the stress of softball. A former Chief Master Sergeant of the Air Force, Gerald came to North Davidson in 1995 to join the school's ROTC program. He played fast-pitch softball across the world during his service. As a kid, he learned how to pitch by throwing rocks underhand down the railroad tracks. He met Lambros at the time high schools were beginning to play fast-pitch, and despite never seeing girls play softball, he offered to help teach his players how to fire strikes instead of lobbing up meatballs. Gerald never complained as he dealt with his chemotherapy. At the same time, another assistant, Jeff Pace, was battling ALS. A father of two daughters, Haley and Carson, who would play for North Davidson, Pace joined Lambros' staff in the late 2000s, manning infield drills and front tossing. ALS affected his voice first. His speech was slurred and he lost the ability to speak midway through the season. His motor skills slowly deteriorated. Still, neither he nor Gerald missed a single practice. The players didn't openly say anything to each other about their coaches. It was understood they were dedicating their season to them. But when the coaches surprised the players by putting special stickers -- a war bonnet for Gerald and JP for Pace -- on their helmets, they sobbed. "You see them every day at practice and every time you put your helmet on for a game, it just reminds you that you're playing for something bigger," said Katie Vick, the team's first baseman. Lambros and Gerald refuse to talk about cancer to each other. If Lambros was running late to practice or looked tired, they both knew why. "Other than that, it was like an elephant in the room," Gerald said. "We kept at the task at hand, which was to get the team ready." Even as Lambros sometimes went straight from a chemotherapy session to practice, sometimes wearing his chemo pump at the field, he would show up at 3:30 and stay for the two-hour practice, then find a ride home so he could shower and rest. Because of the treatment, Lambros had an extreme sensitivity to cold, especially when practices began in early February. He'd bundle himself in layers of sweatshirts, gloves and scarves to stay warm and dry. "Everything had to be lukewarm," Sharon said. "He couldn't even open the refrigerator door. We had been told if he drinks anything super-cold after that chemo agent, it would literally feel like razor blades going down his throat." If there's anyone used to multiple layers, though, it's Lambros. He's very superstitious. Years ago, he saw Kendra Israel eating a Mr. Goodbar and jokingly asked if it was lucky. She offered him a piece and when they won, eating one became a pregame tradition. When Katie Vick's mom, Susan, brought homemade brownies to the field one game, she brought them for every game. "Once you do something, you have to continue to do it through the season until you lose," said Israel, who played with Lambros in the late 1990s and coached with him in the mid-2000s. So the day they won the state title in 2010, he wore a turtleneck, khaki pants and a windbreaker in 90-degree heat. "Stevie Wonder ought to be his ringtone," said Thomas Vick, Katie's dad and one of Lambros' assistants. Even his coaches joined in with the superstitions. They, too, would wear the same outfits, eat the same breakfasts from previous days, sit in the same spots in the dugout. Heck, they even parked in the same spots. For Lambros, they'd do anything. They all saw how cancer wore on Lambros' body. He wasn't able to stand or walk for extended periods of time, so they brought him various chairs and stools. The team's student managers set timers on their phones to remind him to drink Gatorade every 20 minutes so he wouldn't get dehydrated. Lambros often micromanaged his teams, even spending hours after the game doing laundry. Now, everyone repeated to him, "We got this." Many of Lambros' assistants played for him as students, and when they graduated from college they'd return home to join his staff. Generations of families grow up and raise their own children in Davidson County. Kristi Hogan, who graduated from North Davidson in 1992, called the biggest mistake of her life leaving town with her now-ex-husband. When she returned home, where she works as a 911 dispatcher in Forsyth County, she joined Lambros' staff to help first basemen with their footwork and to work with sports medicine. Kiger and the school set up a ceremony during football season to honor Lambros by renaming the softball field after him. 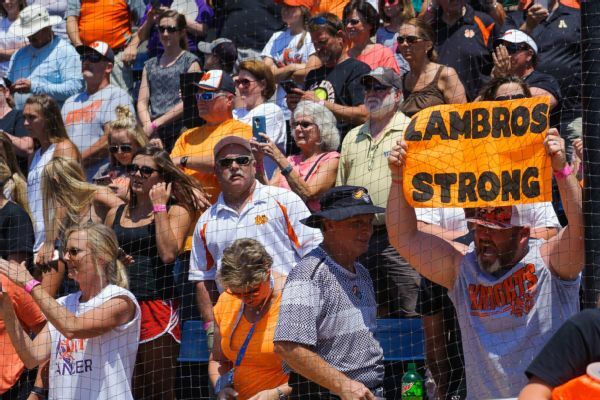 For softball season, the school organized a Strikeout Cancer game to raise money for Lambros and his family. Hogan wanted to do something special for it. She designed special jerseys for the game that the team would wear. They were purple for pancreatic cancer awareness. "Yeah Baby" was scattered by the sleeves. More importantly, the back of each jersey read "Lambros." On the night of the St. James game, the players swapped their regular black home jerseys and took infield in the new ones, to Lambros' surprise. Sitting high up in the bleachers on the third-base side was Mary Lambros, watching her oldest son be honored so beautifully at the field that bears his name. She was exactly where she wanted to be to spend her final moments. This ring is for Mom. Telling her he had cancer was perhaps the hardest thing Mike Lambros ever had to do. Lambros, his younger brother Mark and his younger sister Vickey all got together at the house they grew up in to tell her the bad news in person. She'd already lost her first husband to melanoma in 1982, her second husband in a boating accident in 1997 and another son, Rodney, in 1994. Once she found out about the diagnosis, she made it a habit to call Mike every night at 9 to check how he was doing. Their conversations could be two minutes long or two hours. She always made it a habit to end every one with an "I love you." Mary was an old country girl from Liberty, North Carolina, who owned her own family store in Lexington. She still drove everywhere she needed to and loved her independence. "Although she was 83 years old," Mark said, "she was 83 years young." She never played softball, but given that her son was a coach, she loved it. So much so, she'd name-drop him whenever possible, like he deserved VIP treatment even if they were at a local pharmacy. It embarrassed him. The night of the game began like any other Friday night. Mark offered to drop her off by the complex so she wouldn't have to walk so far, but she told him no in her typical fireball fashion. "I feel perfectly fine!" she said, so they walked downhill together. They were avidly following the game and laughing when Mary suddenly had a dizzy spell. Mark tried to resume the conversation but noticed she looked dazed. She insisted she was fine. He told the woman sitting behind them they needed help. Hogan was among the paramedics who sprung to the scene. They started asking her questions, what her name was, how old she was, when her birthday was. Mary had been gently rubbing Mark's arm when she stopped. She turned to Mark and said, "Son, I know you're still here because I know you would never leave my side, but I can no longer see you and I can no longer hear you." That's when she went into cardiac arrest. Paramedics began CPR. Mark ran to the dugout to get Mike, still focused on the game. When he told Mike that their mom had passed out and was receiving CPR, Mike sprinted out of the dugout and blew by Mark to get to her. Paramedics had been working on her for about five to 10 minutes before the ambulance arrived. EMTs tried to resuscitate her in the back of the ambulance. They told everyone they were going to work on her in the ambulance for a half-hour. They could work faster at the scene as opposed to driving to the hospital. The ambulance wouldn't leave to go to the hospital unless the EMTs could revive her. The game ended, but no one left. Parents stayed in the stands. Players and coaches knelt in a circle in left field and prayed. When paramedics walked out of the ambulance after 30 minutes, everyone knew the worst had happened. There wasn't a dry eye at Mike Lambros Field. Mike told Hogan he knew paramedics did everything they could. He said he was impressed with how fast they worked and got to her. "Y'all went to work," he told Hogan. It was protocol for her, but she couldn't believe that he was thanking them when they weren't able to save mom. 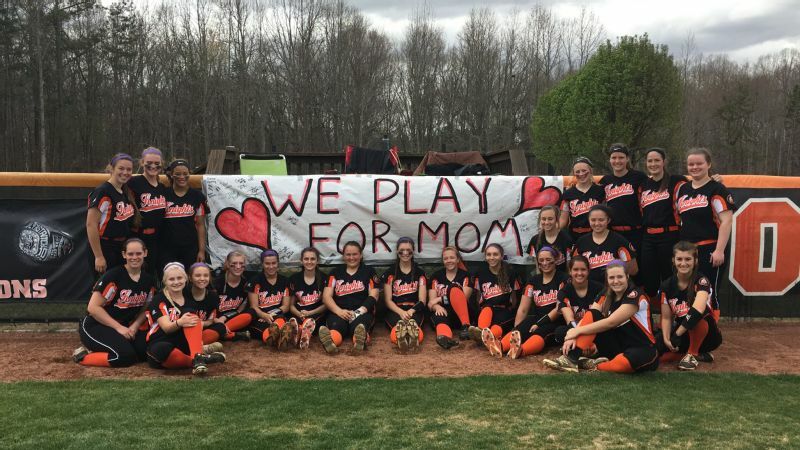 As painful as it was for Mike Lambros to lose his mother, he took solace knowing she died doing what she loved: watching her son coach softball. "For her to be at that game, she was at peace," Mike said. He took solace knowing that his mom died with a smile on her face. "If you had an opportunity to ever pick a way how you wanted to spend your last moment on Earth," said Kip Childress, a former wrestler who became the softball team's public address announcer, "how perfect would it be for you to spend it watching the game you love to watch because of your son, being able to see your son be honored in the way he was that particular night?" Mike missed the game the next day, just the second softball game he had ever missed. (The first was to be at his son Josh's wedding.) His coaches told him to take as much time as he needed. When he came back days later, his coaches and players had made a banner that hung on the center-field fence. It read, "We play for Mom." This ring is for the players. Classes hadn't started when Lambros found out about his diagnosis. It was last August and he was in Aruba with Sharon when he began experiencing excruciating stomach pains. They went to see their doctor of 20 years when they returned home for an ultrasound, and the next day he called to recommend a CAT scan. Later that night, their doctor showed up at their door with a copy of the medical report. Sharon knew it wasn't good for him to make a home visit. Several players were at summer tournaments with their travel teams when they heard about the diagnosis. Some of their parents told them. Others, their travel coaches told them. 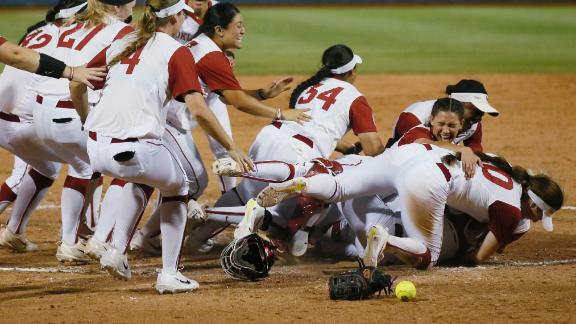 "Honestly, we didn't know if he was going to be with us that season at all," said Brooke Griffin, a shortstop converted into a third baseman. "It was very possible we could show up and he not be there." There wasn't a doubt in Lambros' mind. He wrote in red lipstick on his bathroom mirror "February 13th" for the first practice. Their first game of the season, they scored 10 runs in the first inning. But they dropped two games of a tripleheader on March 11 and lost back-to-back games, which almost never happened to Lambros' teams, in mid-April. In conference play, the Knights ran the table, going 12-0 with an average margin of victory of 11 runs. After a first-round bye in the Central Piedmont Conference tournament, they beat West Forsyth 12-2 to advance to the title game, where Davie, a team they had outscored 23-9 in two games, awaited. Lambros and Gerald gave the ball to Regan Spencer, a hard-throwing freshman who could max out at 64 mph. When she was on, she was lights-out, but sometimes she was erratic. 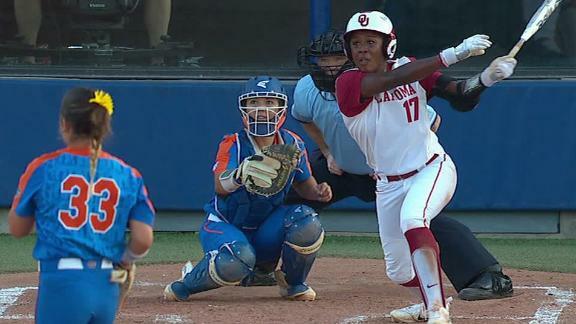 She matched Davie's pitcher with zeroes through the first four innings before running into trouble in the fifth. She hit the leadoff batter, walked another and gave up two RBI singles before exiting. The 8-0 loss served as a wake-up call -- that no one was going to hand them a trophy. Besides, the state tournament is what really matters. UNC, after all, cares more about national championships as opposed to ACC banners. At 21-5, North Davidson was the No. 3 seed out of 32 teams from the West. The Knights cruised through the first two rounds, beating Watauga 10-0 and Page 13-2. Next up was South Caldwell, a team they eliminated from the state tournament the previous two years, and they shut South Caldwell down 3-1 to set up a matchup with fierce rival Alexander Central. 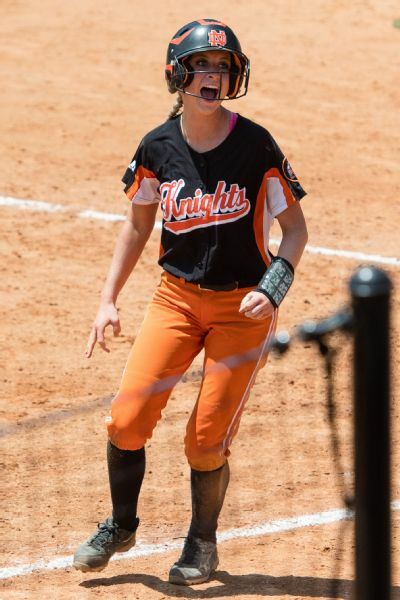 Sydney Snyder hit the game-winning RBI single in the bottom of the sixth inning to lead North Davidson to the North Carolina Class 4-A championship. Anytime they'd meet, it'd usually be deep in the state tournament. In 2014, they were swept by Alexander Central in the final four, as the Cougars would go undefeated and win their second straight state title. The next season, Lambros' team ended Alexander Central's 95-game winning streak to advance to the state semis. The morning of the Alexander Central game, he got a call from his doctors asking if he was OK. He felt fine. While cancer took most of his appetite -- "Everything tasted like cardboard," he said -- he was about to sit down for a popcorn shrimp lunch. His doctors told him he needed to rush to the hospital because they found a pulmonary embolism that needed to be treated immediately. "Three to four different doctors kept coming in and saying, 'My gosh, you've got a huge blood clot close to your heart, you should be begging us for help,' and Mike was pretty much asymptomatic," Sharon said. They gave him blood thinners and made sure he stayed hydrated, but being at the game was out of the question. The players knew he wasn't going to be coaching in person when he wasn't going over the game plan by the back steps, but staying in the hospital didn't stop him from making the lineup before the game and getting play-by-play updates via text. In the biggest game of the season, Spencer got the nod. The day before, she broke a toe on her drag foot in gym class. 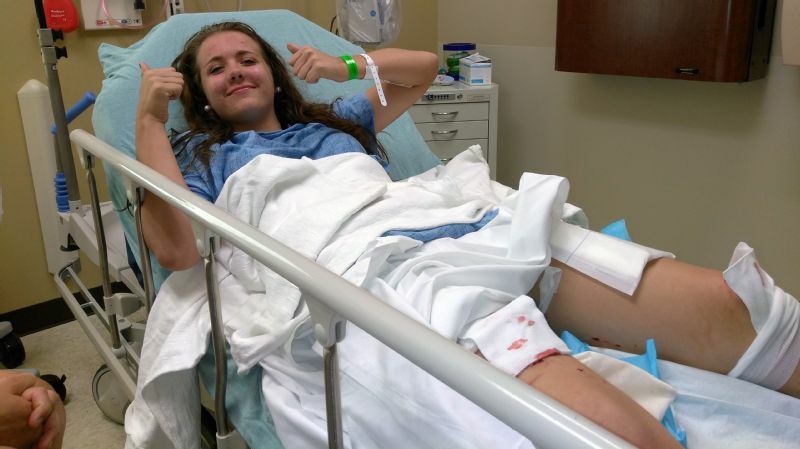 "Just my luck with how clumsy I am," Spencer said with a laugh. It was swollen and purple, nothing some ice and playoff adrenaline couldn't fix. She appeared in each of North Davidson's five losses, and in those games went 0-4, giving up 21 runs (14 earned) in 18 2/3 combined innings. However when North Davidson won, she was a big reason why: In 20 other appearances, she had a 0.91 ERA. Down 1-0 in the top of the second, the Knights loaded the bases for Lexi Bryant, a sophomore who missed several weeks early on with a broken foot she suffered during basketball season. On a 1-1 count, she cranked the Alexander Central pitcher's offering over the center-field fence, off a tower for a grand slam. The game was so loud that it reminded Hogan of a football atmosphere. Spencer couldn't hear a word for another two minutes while everyone in the dugout went wild. From the hospital bed, Lambros was hollering. Lambros was out of the hospital the next afternoon with a week to prepare for Richmond in the best-of-three state semifinal series. In Game 1, North Davidson scored first but despite having seven hits through the first four innings, trailed 3-2 entering the fifth. 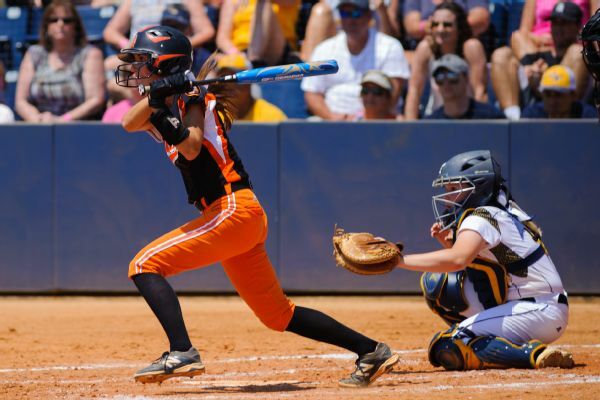 That's when Autumn Stover, a senior left fielder who raised her batting average .219 points between her sophomore and junior seasons, got in everybody's faces, sensing everyone wanted to be the hero. "Y'all need to play for your teammates," she yelled. She was right. Then they broke through. Sydney Snyder drove in two runs with a bases-loaded single and Bryant followed with a two-run double as part of a five-run fifth inning. In the sixth, Katie McNeill hit a home run, her eighth of the year, and Lydia Berkley hit a two-run double to blow the game wide open. The next night, McNeill hit an RBI single in the first inning to give North Davidson a 1-0 lead and Stover hit a solo homer to left that made it 2-0. The duo of Spencer and McNeill inside the circle was fluent. 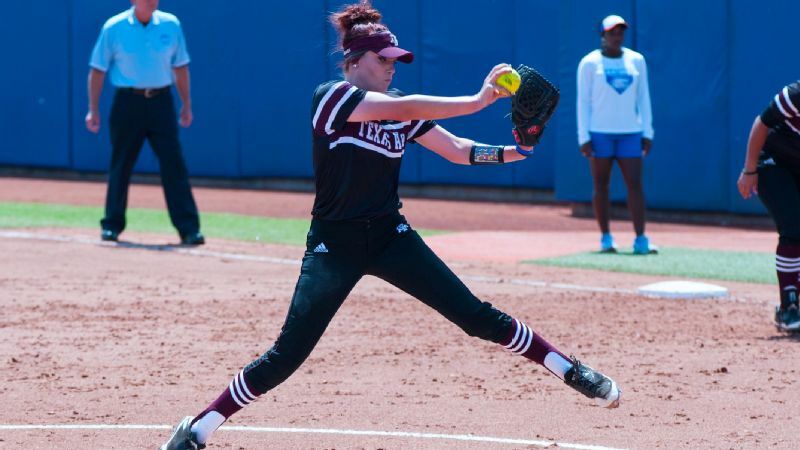 Spencer had given up one unearned run, three hits and three walks in four innings, and before Richmond's hitters could see her for a third time through the lineup, McNeill, a finesse pitcher whose movement would keep hitters off-balance, entered. Her go-to pitch, which Gerald coined "Indonesia," is more of a combination of a change-up, drop ball and curveball. "It moves a lot and it's sick," Hogan said. It's what she threw to draw a called third strike to send North Davidson to the final. The team they'd face in the championship series was Cape Fear, hungry for redemption after a runner-up finish last year. The Colts finished the regular season undefeated and had outscored its opponents 323-49. They had two players, Bri Bryant and Haley Cashwell, who signed NLIs to Division I programs. Cape Fear entered with a 28-1 record and USA Today's No. 2 national ranking. With all that in mind, the championship series was the most relaxed Lambros has felt on the diamond. Based on her warm-up pitch, Spencer seemed beyond nervous. Gerald told her on the first day of practice she'd get the start in the first game of the series so she could have more time to prepare herself mentally. When she was getting loose, she airmailed the ball over the catcher's head. Yet from the first pitch, Spencer dominated with a two-hit shutout. Offensively, Olivia Coleman, who entered the game hitting .227, went 2-for-3 with a two-run single, while Faith Jarvis went 2-for-4 with an RBI. Two years ago, North Davidson was in the exact same situation, and Hogan made sure to remind them of it. They beat D.H. Conley in Game 1 of the series before losing Games 2 and 3, played on the same day, 5-0 and 1-0. "They can celebrate," Hogan said, "but we've got to keep them in check." Autumn Stover rallied her team in Game 1 of the state semifinals, then scored the winning run in the championship series. Spencer would get the start in Game 2 as well, and she picked up right where she left off, retiring six of the first seven batters and keeping Cape Fear off the board. Lambros and Gerald thought they'd get a couple innings out of Spencer, but they let her ride. McNeill had been the designated player and cleanup hitter, but was warming up every inning just in case. "If you come in," Lambros told her, "you're going to be coming in in a mess, so I need you to be ready for that." Berkley's first-inning RBI single and Lexi Bryant's RBI groundout in the second gave Spencer a 2-0 lead, but she faced trouble in the sixth when she faced the top of the order for the third time through. Cashwell singled and reached second base on a miscue. After a sacrifice bunt and a walk, the second baseman Berkley misplayed a sharply hit ball to allow a run to score and Bri Bryant to reach third. The next batter grounded to the shortstop Snyder, who instead of trying to cut down the tying run Bryant at home made the sure out at first base. When the following batter singled over Griffin's head to put runners on the corners with two outs, Lambros knew it was time for McNeill to enter. The senior McNeill, who is headed to Greensboro College in the fall, threw one pitch, an inside curveball, to induce an inning-ending groundout. When she went back to the dugout, Spencer immediately hugged her. Lambros told his team they were playing with free money, and they're about to send up the heart of their order. He had a premonition: If Stover gets on, they're winning the game. The pitch was low and in, right in her sweet spot, and she lined it to left field. Up came McNeill, and instead of swinging away, she laid down a perfect bunt to move Stover to second. After a flyout, Snyder sat back on a 1-1 change-up and lined it up the middle. Stover rounded third and sprinted toward the plate. Bri Bryant fired a seam from center field but Cape Fear's pitcher cut it off as Stover slid feet first into home. For as much rest as Lambros needed, he barely slept between Games 1 and 2. His body was in excruciating pain. He had recently started a new chemo regimen, a less aggressive one that didn't involve a chemo pump he'd need to bring home, but one that took time to adjust to. He wasn't nervous about the game, even with three outs to go. "You just knew it was going to happen," Lambros said. "I just never doubted those kids." McNeill struck out the first batter on a rise ball and got Cape Fear's No. 9 hitter to fly out weakly to left. Once she got two strikes on Cape Fear's leadoff hitter, she painted the black with Indonesia. As players stormed out of the dugout to mob McNeill on the infield dirt and Sharon tried to make her way from the stands to the field, Lambros began crying underneath his sunglasses. Given everything he endured, how rewarding it felt to win. He dedicated this season to his biggest fan, whose presence was no doubt at the field. The players exchanged their black home jerseys they wore during the game for the purple ones they packed specifically for the celebration. They all received medals and it seems too fitting that the ribbons were also purple and orange. The police escorted them back to the high school, where fans waited with signs, balloons and sparkling cider to get the entire championship feeling. The players gathered around their coach for a photo, then turned around so he would be surrounded by 28 jerseys with the last name Lambros. This ring is for everyone around Lambros. It's for Sharon, who always said "we have cancer" after doctors told them about Mike's diagnosis. Who researched all facilities and physicians to make sure he had the best medical care possible. Who stayed with her husband through chemotherapy sessions that would sometimes last eight hours. Who made room-temperature smoothies when he couldn't have anything cold. Who loved Mike, whether his hair was reminiscent of "Starsky and Hutch" or if he shaved his head so he could say cancer didn't steal his hair. It's for Josh, who as a kid would hit the mat with Dad's wrestlers if someone was absent. Who would hang by the softball field and shag fly balls and help set up tees. It's for Mark and Vickey, who were his rocks as they all lost their mother. It's for the doctors and nurses at Wake Forest Baptist, who made him a cake and turned their scrubs into Lambros jerseys for his first chemotherapy session after winning the championship. Lambros' ring size went from a size 10 to around a 7, so the only way for him to wear his national championship ring is if he puts it on his middle finger. The plan is for him and the softball team to receive this year's rings at the first home football game, against Davie. He spoke with the people at Balfour, who assured him they'll make him another championship ring if his fingers change sizes again. The Wednesday after winning the championship, the six seniors and some assistant coaches met at Lambros' house to design the 2017 ring. The assistants had their suggestions, but Lambros told them it was the seniors' ring, so they should be the ones to decide what it looks like. He didn't offer any input. They spent roughly two and a half hours before they finalized it. The face says 2017 State Champs and has the interlocking ND inside a softball diamond. First, second and third base are orange, while home plate is purple. The left side will say each players' last name and position with the Knights' logo. On the right, LambrosStrong. There's a small "Yeah Baby" hovering above a purple No. 1 placed on top of the state of North Carolina. Engraved on the inside of the ring is a message. "Be a part of something bigger than yourself."